My Uncle Mike called and talked for a long time, telling me all kinds of stories about the family (my great-grandfather, my grandfather, the dog “Midge” in the family photo, and his mom). My Uncle Mike is The Source for genealogy on the Wilcox side and I really enjoyed our long talk. He’s in his 70’s. My plan was to watch Lara Logan on 60 Minutes and I only got fifteen minutes into that painful interview when the phone rang again: my dad. My dad had lots to say, too, and much of it was about genealogy. We also talked a bit about birds. 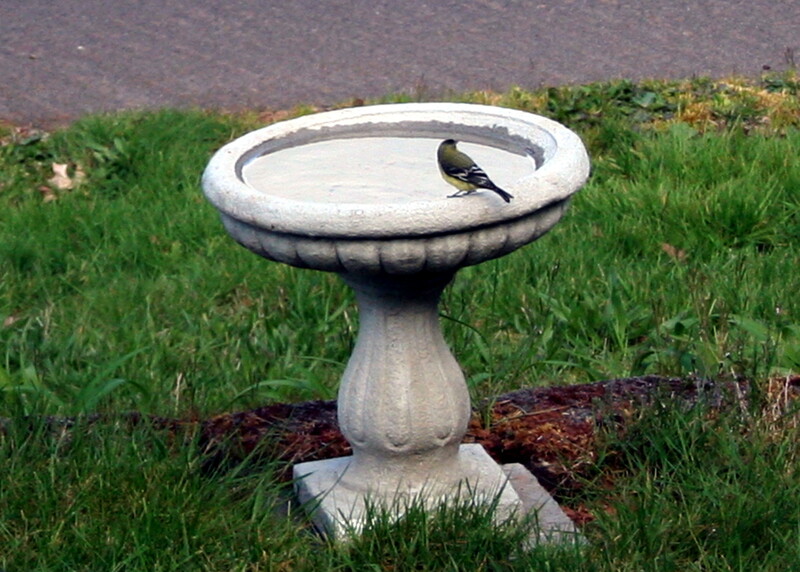 This came about because I had a “new” visitor to my bird bath: an olive backed lesser goldfinch male. “Cool”. My dad said he’d never seen one. I told him about the osprey that was circling overhead this morning, calling out “chree-chree-chree” over and over. 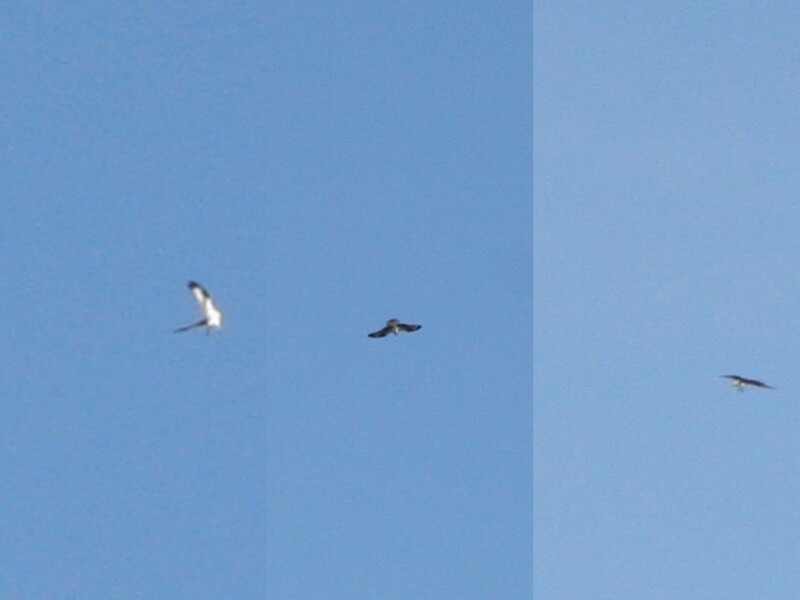 I live above cliffs that overlook the Willamette River and the ospreys love to fish in the Willamette. But this one was doing a mating song. (What I would give for a good telephoto lens some days!) There he is, declaring his love over and over and over. My dad told me that there is an osprey nest on the steel bridge out of St. Anthony, Idaho – if vandals haven’t gotten to it. I hope vandals haven;t gotten to it: they are a Federally protected raptor. I no sooner hung up the phone with my dad when CBS interrupted “60 Minutes” with “breaking news” about Osama bin Ladin. Wow. But family history pre-empts that. Sorry, I’m not making any political statement outside of “wow”. We’ll see what that news brings us on the morrow. I learned more about my family tonight, small stories that bring things into focus. My Uncle Mike is much younger than my dad and has a different perspective. He often accompanied my Great Grandfather. He had a wonderful rapport with my grandfather. He told me about his mother, Virginia (Bellinger) Newby, who mas my dad’s step-mother. (I think I spelled Newby right. I have it right on Ancestry.com). Uncle Mike promised to share things with me as I research my family & email him questions. My dad has more on his mother’s side, the Cusick’s. I have hardly anything on the Cusick’s. Dad found things in his bachelor uncle’s estate (my beloved Uncle Frank) that he wants to share with me. Can you say “excited”? I am so interested in all this. All this history… roots in the ground. Roots in American soil, in Wales, Ireland, Scotland and England. Roots in Holland, even. War heroes and… cowards as well. Men who could not serve because they were new immigrants. Land deeds. So before I close tonight, here’s a question for you: do you know the difference between “immigrant” and “emigrant”? It’s an important distinction. My husband has a rich history of emigrants on the Oregon Trail. I have uncovered a rich history of immigrants from the Old World. God Bless America. The America my ancestors fought to create.